The download can be placed anywhere you so desire. From here, go to the downloadable mods tab. 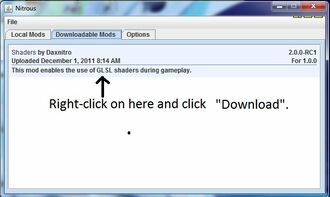 Right-click the shaders file and select download. This does not work for some users. If that is the case, skip to the next section where I'll explain how to manually import the shaders. 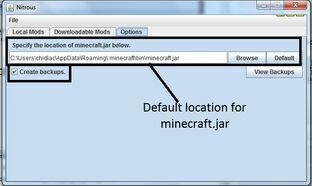 Default location for your minecraft.jar is "C:\Users\<User>\AppData\Roaming\.minecraft\bin\minecraft.jar" Once this is done, proceed to the next step! The final step (unless you've had trouble downloading the shaders) is to go to the "Local Mods" tab and then click "Install Mods". If all goes well, it should install without any problems and you'll be ready to go! If you have problems installing the mod, a likely problem is you NEED a fresh minecraft.jar file! 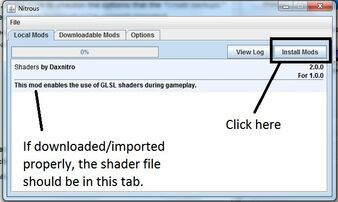 If you notice the installer gets stuck on "Installing Shaders..." just close the exe and reopen it and click install. After a couple tries it should complete successfully. Make sure you tried to install while Optifine is installed. If you have any other issues check out the log by pressing "View Log". If you still need help, you can ask in this forum thread over at MinecraftForum. If you wish to paste your log, make sure to use pastebin. Either Dax or many other active community members will be happy to assist you! If there's any more common issues with a solution I'll try to keep this section up-to-date concerning those, or feel free to add! Make sure your video drivers are up-to-date! Check your manufacturer's website for updates. Any issues regarding that are covered there. Shaders2 is not officially compatible, but there are no conflicts or crashes caused as of yet from installing it. If you have troubles after installing, it's most likely unrelated problems with ModLoader. For any other video-related issues, click the link above for support.